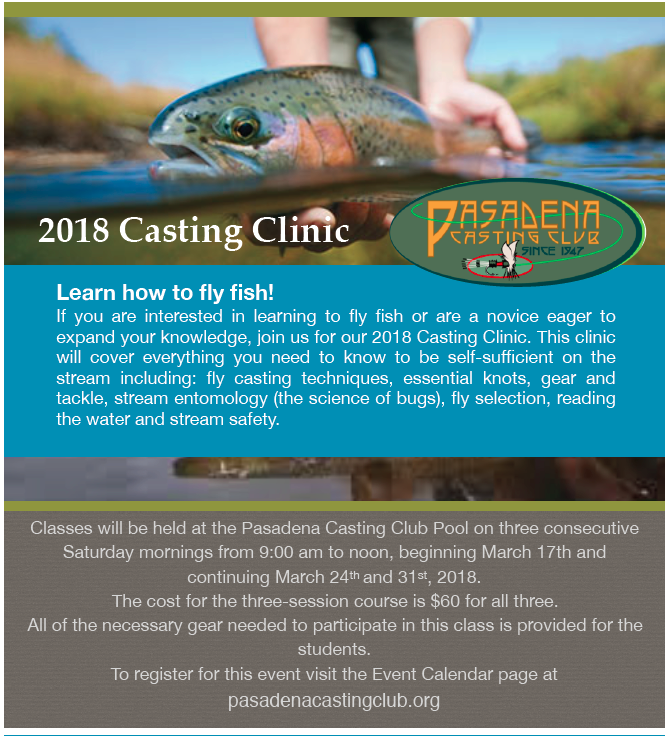 Founded in 1947, the Pasadena Casting Club is a group of fly fishing enthusiasts dedicated to the art of angling and casting, conservation, education, catch and release philosophy, and camaraderie through Club meetings, outings and events. Waitlist: If the class is full, students may request to be put on a wait list. Once a spot opens up, students will be notified and enrolled on a first-come, first serve basis. If you plan on attending all three sessions, it is only necessary to register for the first date. Questions: Contact Leigh Ann Swanson at (310) 741-7645 or lacraven22@hotmail.com.